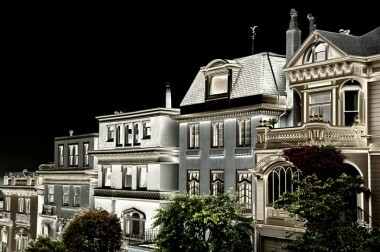 Houses of Divisadero Street was taken from top of the hill outside the Japanese embassy overlooking a panoramic view of San Francisco Bay and waterfront. This “after dark” look impression of these impeccably restored homes was taken to complement the Painted Ladies After Dark. The solarization photographic technique was used to make both. One of two matching set.